GAHS sophomore Bode Wamsley (9) attempts a crossing pass during the Blue Devils match against Portsmouth on Sep. 13 in Centenary, Ohio. GAHS freshman Preslee Reed (22) brings the ball up field, during the Blue Angels’ non-conference match against Point Pleasant on Oct. 11 in Centenary, Ohio. 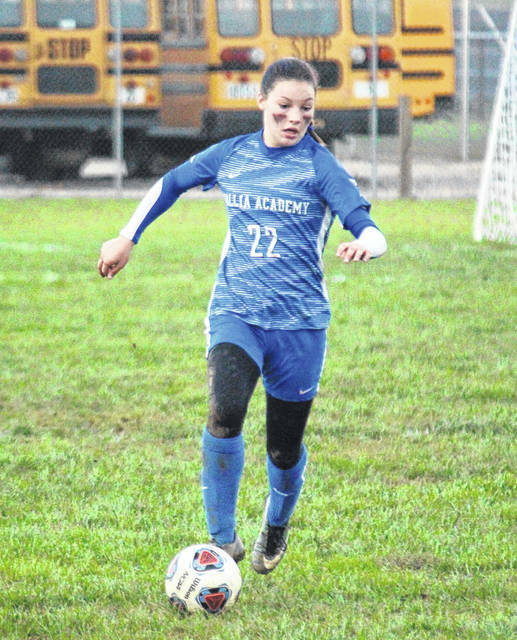 Gallia Academy landed eight athletes — four boys and four girls — on the Division II all-district soccer teams, as selected by the coaches from with the district. The Blue Angels — who were 12-4-1 on the year, while winning the Ohio Valley Conference championship — were represented on the first team by freshman Preslee Reed. GAHS senior Gretchen McConnell was on second team, after being selected as an honorable mention last season, while playing for the Blue Devils. The Blue Angels had two honorable mention selections, in seniors Abby Cremeans and Trinity Eggers. 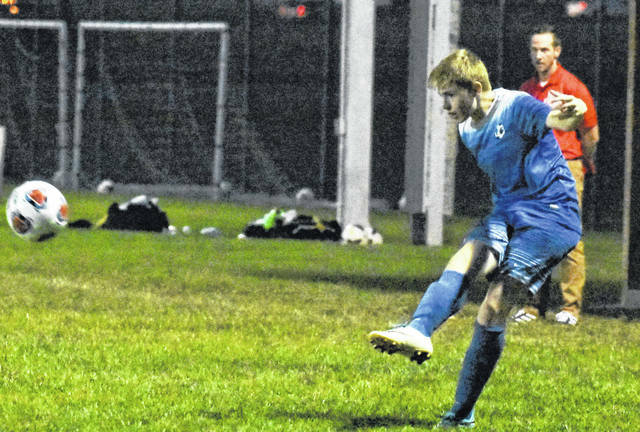 The GAHS boys — who concluded the year with an 8-5-3 record, while finishing second in the OVC — were represented on the first team by freshman Brody Wilt. On second team for the Blue Devils was junior Pedro Herrera Moreno, while junior Ian Hill and sophomore Bode Wamsley were named honorable mention. Hill was a second team selection last fall, and is the only Blue Devil repeating as an honoree. The Blue Devils were also among teams in the Southeast district to not receive a red card this fall. Luke Baldwin, Logan Elm Jr.
Drew Batson, Miami Trace Sr.
Cody Fyffe, Fairfield Union Sr.
Caleb Perry, Miami Trace Jr.
Andrew Ramsey, Zane Trace Jr.
Hamid Sharif, Logan Elm Sr.
Blaise Tayese, Washington CH Sr.
Brody Wilt, Gallia Academy Fr. Player of the Year: Saad Alharbi, Athens. Coach of the Year: Lee Lord, Jackson. Assistant Coach of the Year: Sean Sweeney, Miami Trace. Kody Burns, Miami Trace Jr.
Gavin Ewing, Logan Elm Jr.
Pedro Herrera Moreno, Gallia Academy Jr.
Kaden Howard, Zane Trace Jr.
Seth Pennington, Logan Elm Jr.
Allan Schreckengaust, Washington CH Sr.
Justin Shoemaker, Miami Trace Jr.
John VerDow, Fairfield Union Sr.
Sam Bernard, Fairfield Union Jr.
Kyler Conn, Miami Trace Jr.
Bryce Coy, Washington CH Sr.
Ian Hill, Gallia Academy Jr.
Sean Johnson, Zane Trace Sr.
Grant Kuhlwein, Washington CH Jr.
August Langley, Miami Trace Sr.
Tyler McClellan, Fairfield Union So. Hassan Sharif, Logan Elm Fr. Bode Wamsley, Gallia Academy So. Jackson Wells, Zane Trace Jr.
Connor Wiget, Logan Elm Sr.
Reagan Conrad, Fairfield Union Jr.
Macy Creamer, Miami Trace Sr.
Taylor Davis, Fairfield Union Sr.
Kassidy Hines, Washngton CH Sr.
Becca Ratliff, Miami Trace Sr.
Preslee Reed, Gallia Academy Fr. Riley Schultz, Logan Elm So. Player of the Year: Jayla Campbell, Unioto. Coach of the Year: Caitlin Francis, Miami Trace. Assistant Coach of the Year: Danielle Morgan, Waverly. Cassidy Lovett, Miami Trace Sr.
Gretchen McConnell, Gallia Academy Sr.
Victoria Morrison, Miami Trace Sr.
Isabel Ruff, Fairfield Union So. Mackenzie Shaffer, Washington CH Sr.
Sydney Spires, Logan Elm So. Emma Thomas, Fairfield Union Sr.
Lizzi Baker, Fairfield Union Jr.
Magarah Bloom, Miami Trace So. Brooklyn Bryant, Logan Elm So. Abby Cremeans, Gallia Academy Sr.
Trinity Eggers, Gallia Academy Sr.
Chloe Lovett, Washington CH Fr. Jordan Schultz, Logan Elm Sr.
Aubrey Schwartz, Miami Trace Jr.
Taylor Smith, Washington CH So. Bri West, Fairfield Union Jr.